” It was absolutely lovely to see how much they follow the rules and take responsibility. Couldn’t stop smiling 🙂 ” – Ranjitha, a parent in California, about the youth participation in the AlligatorZone Ambassador initiative. I want to thank the organizers of AlligatorZone for doing a wonderful job of putting this together remotely and our presenters Anush with Juan, and Nick for the best duo of presenters ever. It made a big difference to have the ambassadors involved. It was an educational experience for everyone. The audience was enraptured by your products and presentations. We received 17 evaluations from the 60 people in attendance and everyone said they want more! – Librarian in California after a session of AlligatorZone. “The event was extremely educational and my daughter would love to be part of the next AlligatorZone. We also loved the startups reaching out to the children offering different perspectives of the startup world i.e the business idea, the business challenge, the application, the Funding and the prospective pros and cons of the idea. The amount of interest generated between the younger audience and the founders was awesome. Please keep us posted on the next Alligator Zone. My daughter would definitely want to be there.” – A father in California. “Emilija, our teen volunteer, did a fantastic job helping to set up the room, greeting the presenters, and introducing the presenters. She seemed to appreciate the opportunity to help out and show some leadership.” – The Children’s librarian after a recent session of AlligatorZone in the mid-Atlantic region. “Some of the best library programs result when librarians collaborate and support community-driven grassroots efforts and ideas. The leadership at SiliconGlades has proven that this is so. SiliconGlades has been a great friend to the Hillsborough County libraries – we enjoy working with them and admire their ideas and inspiration.” – Megan Danak, Principal Librarian, Library Services, Hillsborough County BOCC, Tampa Bay, FL. “AlligatorZone is a brilliant idea. 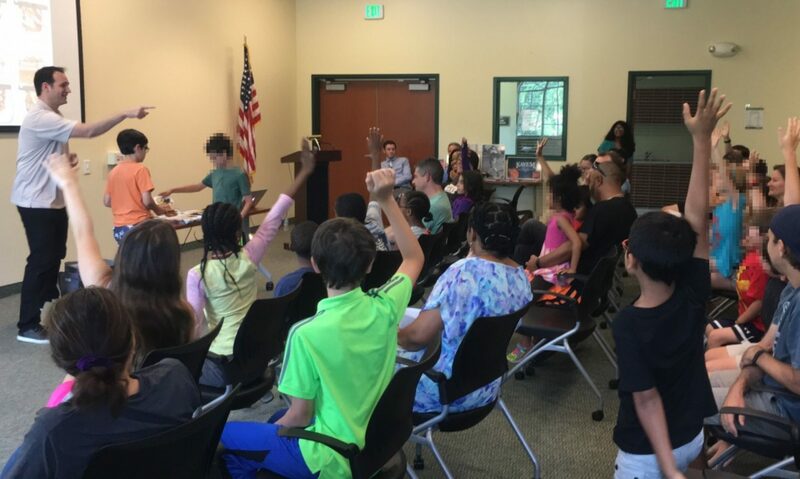 We have had three sessions at our Library and it has been exciting to see how engaged the children and families are with the entrepreneurs.” – Karin Bricker, Library Manager, Youth and Outreach Services, City of Mountain View Public Library, Mountain View, CA. “Fear of the unknown is a huge obstacle to overcome in life. AlligatorZone exposes children to an entrepreneur’s behind-the-scenes challenges, before they learn that their dreams are far-fetched or out of reach. While the realities and missteps are not glossed over, each personal story reveals a passion for that business. The deepest lesson taught at each program is that ideas can be made to come true.” – Ellen Book, Branch Manager, Pinecrest Branch Library, Miami-Dade County, FL. “I wanted to thank you for bringing the AlligatorZone program here to Radnor Library. The presentations were fascinating, especially the BioBots group, and it was clear that both kids and adults really enjoyed it. In fact, I had one mom call me afterward to thank us for offering the program and ask when we would host again! She loved the STEM connection, and her daughter found it very inspiring and thought-provoking.” – Carrie Sturgill, Head of Children’s Services, Radnor Memorial Library, Wayne, PA.
“The programs and services offered by SiliconGlades spread greater awareness of the library to local entrepreneurs and small businesses. They introduce both kids and adults to entrepreneurial ways of thinking while at the same time foster conversations and collaboration among entrepreneurs, all in the context of the public library. AlligatorZone and Product Hunt Meetup programs have given us the opportunity to highlight library resources available to entrepreneurs and attendees, as well as connect business start-ups to helpful information and one another.” – Andrew Breidenbaugh, Director, Tampa-Hillsborough County Public Library, Tampa Bay, FL. “I am so grateful and appreciative of this opportunity – to let us come speak to families all over the Bay Area. I had such an unexpectedly wonderful time at AlligatorZone just now at the library. I have never met a warmer, more open-minded, entrepreneurial-spirited, gracious, and supportive crowd. Even the librarians were excited by our talk. I attribute that as a testament to your ability and hard work and as a founder myself, I know it probably was not easy. As I told my parents, it is days and events like this that make my startup worth it. It is the chance to connect with so many people of all different backgrounds and listen to what they think. I love how the focus is not on a dull speech, but an active dialogue and conversation with the audience. I love how brave the young ambassadors were and most importantly, I am in admiration and full appreciation (from my heart) how you are able to coordinate such an event remotely. Your passion, shines through in how well this event was organized. It is incredibly rare to be able to talk about your startup (essentially, your passion and investment and vision) in front of people that aren’t skeptical. And AlligatorZone was a reminder for me on why I set out on this path in the first time. Because sometimes, it can get really tough.” – a startup founder in Silicon Valley.